Thomastik-Infeld and Connolly Music are the proud sponsors of Mimi Zweig's StringPedagogy.com Online Edition, providing free access to music teachers and aspiring violinists, violists, and cellists. Mimi, Professor of Violin at Indiana University's Jacobs School of Music, and director of its Strings Academy, is world renown for her innovative violin teaching and methodology. 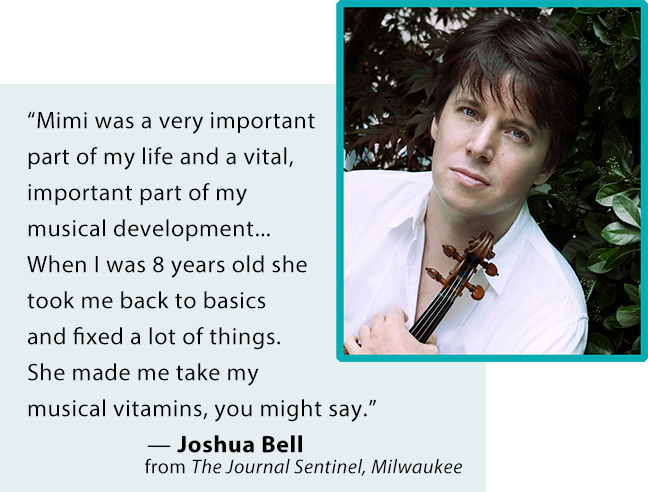 Her basic teaching principles are rooted in how a musician's body moves physically. She teaches violinists to play with a physical freedom that causes a violinist's performance confidence to soar. With this muscle memory embedded in their body, the violinist is now free to play with a level of musical sensitivity they couldn't attain before. And the subtle tonal nuances that result help create memorable, and moving performances. Her students have gone on to teach and perform worldwide, winning numerous competitions along the way. Mimi's greatest labor of love has been pulling together a comprehensive set of lessons for string music educators. These lessons are available as videos, and also as downloadable PDFs. Assisted by associate professor Brenda Benner, and co-director Susan Moses, content is also available for helping teachers set up their classrooms for optimal learning, including lessons in teaching the cello using Mimi's teaching principles. Sign up for free at the bottom!